Today I found out Mr. Rogers was an ordained Presbyterian minister. After Fred McFeely Rogers, better known as Mr. Rogers, graduated from college in 1951, receiving a B.A. in Music Composition, he began working in television, at first for NBC and later for WQED, which was a Pittsburgh public TV station that was the U.S.’s first community supported TV station. While with WQED, working on The Children’s Corner, he used his off time to study theology at Pittsburgh Theological Seminary, as well as to take courses in child development. By 1962, he received a Bachelor of Divinity degree and was ordained as a minister in the United Presbyterian Church and charged with continuing his work on creating and contributing to wholesome children’s television programs, which was his passion. He got his first job as a gofer at NBC and worked his way up from there, working on such programs as NBC Opera Theater, the Gabby Hayes’ Show and as a floor director on The Kate Smith Hour and Your Lucky Strike Hit Parade. He ultimately left NBC, however, because he felt their reliance on advertising and merchandizing was significantly undermining their ability to produce quality children’s programs that not only entertained, but also educated children, which was more or less his original goal in getting into TV in the first place. From there, he went to the public station WQED working on Children’s Corner, which, ironically enough, 30 segments of were later purchased and aired by NBC. Nine years later, Mr. Rogers ended up working at CBC in Toronto, Canada developing a 15 minute children’s program called Misterogers, which was very similar to his later, much more famous show, Mister Rogers’ Neighborhood, even including some songs and characters that appeared in the latter program. After three seasons, though, Mr. Rogers left CBC to move back to western Pennsylvania, with his wife and he feeling it was a better environment for their two sons. Upon leaving, Mr. Rogers acquired the rights to Misterogers from CBC and began work on his new show Mister Rogers’ Neighborhood, which would at first be aired on the Eastern Educational Network and later nationwide in the newly created PBS. When PBS was first formed, Mr. Rogers’ passionate speech before the U.S. Senate Subcommittee on Communications in 1969 nearly single handedly managed to up PBS’s funding from a likely $10 million to the original $20 million they had been supposed to receive before cuts were proposed. Click here to view that speech. Michael Keaton was once a stagehand on Mister Rogers’ Neighborhood. He eventually quit his job there to pursue acting full time. Mr. Rogers once appeared as preacher, Reverend Thomas, on an episode of Dr. Quinn, Medicine Woman called “Deal with the Devil”. The reason Mr. Rogers started wearing sneakers on the show was because they made less noise than normal dress shoes when moving around behind the sets. 895 episodes of Mister Rogers’ Neighborhood were filmed with the first episode broadcasting in 1968 and the last episode shot on December of 2000 and was subsequently aired in August of 2001. Mr. Rogers did the voices on the show for: King Friday XIII, Queen Sara Saturday, Henrietta Pussycat, Daniel Striped Tiger, Lady Elaine Fairchild and Larry Horse, among others. He also composed all of the music on the show. Queen Sara Saturday was named after Mr. Roger’s wife, Sara Joanne Byrd. Mr. Rogers didn’t just try to teach children important life lessons and the like, but he also produced a series of specials intended for parents called “Mister Rogers Talks to Parents About X”, where X was whatever the topic of the day was. These shows were meant to help parents be able to answer any questions their child might have after watching a particular Mister Rogers’ Neighborhood episode. Mister Rogers’ Neighborhood saw its best ratings in the mid 1980s, being watched by nearly 8% of all U.S. households regularly. Mr. Rogers was red/green colorblind. Contrary to rumors spread about on the Internet, Mr. Rogers was never a sniper in the military nor was the reason he wore sweaters because he had tattoos all over his arms and body, one for each person he killed. These, and other similar rumors, first started on the Internet around 1994 and saw a surge in popularity after his death. Mr. Rogers never served in the military. Mr. Rogers once appeared on the Soviet Union children’s show Spokoynoy nochi, malyshi (Good Night, Little Ones) and was the first foreign guest to do so. That show has been on the air since 1964. 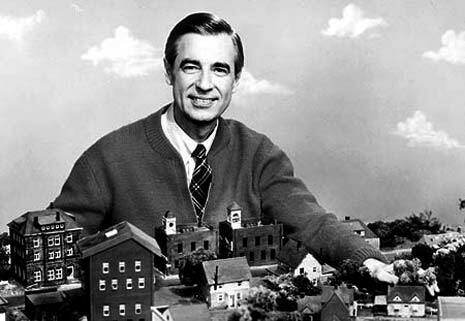 The goal of Mister Rogers’ Neighborhood, as put forth by Mr. Rogers was to promote: good self esteem, self control, imagination, creativity, curiosity, appreciation of diversity, cooperation, patience, and persistence. Mr. Rogers ultimately died of stomach cancer at the age of 74 years old on February 27, 2003. THE POWERS TO BE SHOULD HAVE INCLUDED HIS MILITARY CAREER THAT I UNDERSTAND WAS WHAT HEROES ARE MADE OF. @Richard: Mr. Rogers never served in the military.